Roger Ailes has been fired from Fox News. We should feel good about this. It’s one of those sweet moments where the right thing actually happens. In a post-Anita Hill world, to see a man dropped from his position of power so soon after sexual harassment allegations were brought against him—two weeks!—well, that’s the definition of progress, right? Yet somehow, what should be experienced as a victory for anyone who hates both the work Ailes proliferated and the lifestyle he maintained doesn’t quite qualify as one. The facts are thus: in the middle of a not-yet complete sexual harassment investigation, Ailes “resigned” from his position as the founding CEO of Fox News. He only vaguely alluded to why he was leaving; there has not yet been an apology or acknowledgment of his actions from the company. Additionally, his firing came with a reported $40 million paycheck over the next few years, during which time he will continue to do a lesser version of his job, advising fellow Bad Man Rupert Murdoch, who has replaced him for the time being. Fox remains a hydra of Bad Men: Steve Doocy, Bret Baier, Bill O’Reilly—they all stay, despite some early threats that they’d leave with Ailes. A company culture that reportedly allowed Ailes to rally many of these high-profile anchors to publicly support him in an attempt to silence more lower-level employees will hardly be upset. 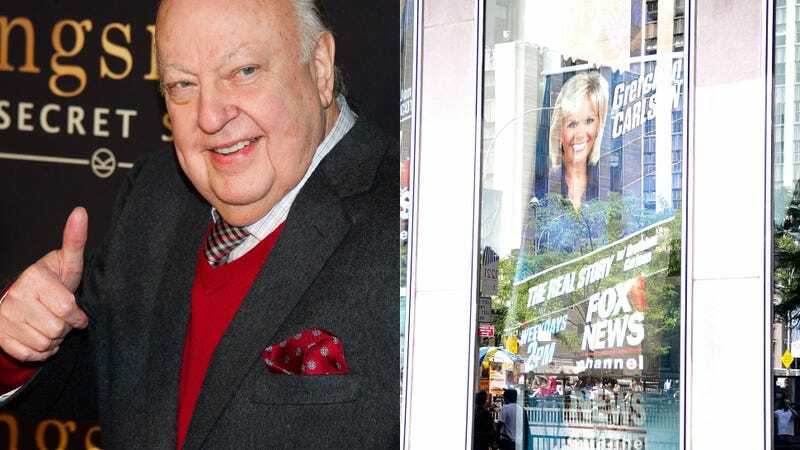 Despite all this, Gretchen Carlson and the other women who have anonymously spoken to investigators have not backed down from their original claims, instead bravely facing Ailes’ wrath and the criticism of their spineless and dull-witted former and current peers. Ailes’s contract is up in the winter of 2016. According to the many Murdoch-world sources I’ve spoken with in recent weeks, Ailes has been expecting to renew his deal. “Rupert is going to need me to elect the next president,” Ailes is said to have told an associate. But Ailes may have grossly overplayed his hand. According to sources, the fact that Fox’s ratings held steady during Ailes’s leave of absence last year over a health scare has given the Murdochs confidence that Fox could endure in the post-Ailes era. It’s an era that now seems to be closer. According to four high-placed Fox sources, Murdoch is upping his presence at Fox while Ailes has become less visible to anchors and producers, signaling a shift that marks a new chapter in the network’s history. The most visible change is that, since June, Murdoch has been attending Ailes’s daily executive meeting held on the second floor of Fox headquarters. Ailes is also 76, and his age and past health issues certainly have something to do with his shelf life at Fox—not to mention his on-again, off-again relationship with 2016 Republican Presidential nominee Donald Trump. So Ailes gets to leave under circumstances that are about as positive as they could be for someone accused of sexual harassment by a couple dozen women. He will stay on as an “advisor” to Fox and get millions of dollars to do it. This is normal, of course: executives typically get handsome payoffs, no matter the circumstances under which they leave. This ending, for now at least, is just too fittingly Fox News—the fall barely qualifies as such, when there’s such a cushion to land on. And then there’s Murdoch, Ailes’s replacement. Aside from his dramatic personal history of dramatic and/or bad behavior (depending on which side you’d like to take), he’s the head of a company that regularly publishes sexist and unethical content on its various platforms. Murdoch has no history of workplace harassment, but in the ‘90s, his company News International reportedly paid half a million pounds to quietly settle a sexual harassment suit against former Sun editor Stuart Higgins. And in 1998, Murdoch reportedly put a halt to a TV movie based on the pro-Anita Hill book by Jane Mayer and Jill Abramson, all because he was friends with Clarence Thomas. Under Murdoch’s watch, Ailes has allegedly harassed his coworkers for decades. For every woman he’s worked with who just can’t imagine what Carlson is talking about, think of the many others who still aren’t comfortable enough to come forward and speak, even anonymously. If Baier sounds at ease, it’s because Fox hasn’t really changed. They’ve just gotten rid of one of the bad guys. Several more are waiting in the wings, ready to keep doing the job they’ve always been paid to do.